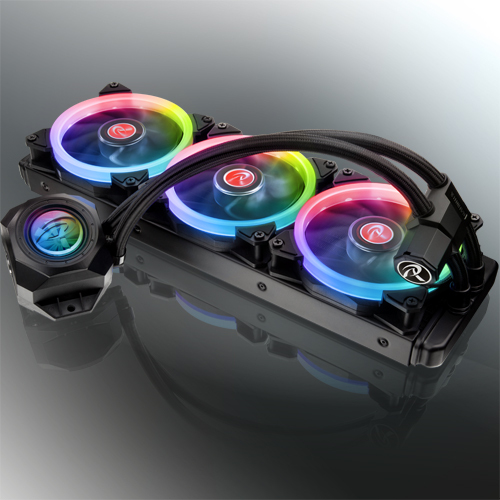 ORCUS, RAIJINTEK’s evolution All-In-One liquid cooling CPU cooler, designed in Germany and made in Taiwan. With several years of experience in liquid cooling products and cooperation with global engineers and manufactures, RAIJINTEK’s RD team developed the concepts of most performing AIO CPU liquid cooler and spent years to design one of most user friendly and spot light product for enthusiasts. ORCUS’s copper water block is a most advanced design of micro channels (0.1mm), extra large contact fin area with multiple channels for the best direct flow of liquid. More than this, ORCUS’s Pump is placed externally which will not incur vibration and stress on M/B and CPU. ORCUS external Pump is designed for high Q-Max, low dBA, and contains a reliable Bearing type. Not only a new design pump and water block are used, ORCUS’s radiator is also using high density design fin radiator. ORCUS has led the trend to designing a “Rotating Blade” with most popular RGB LED lighting inside tank, which able to show water flow and indicates the coolant level. More than rotating blade indicator, ORCUS is also designed to be refillable. 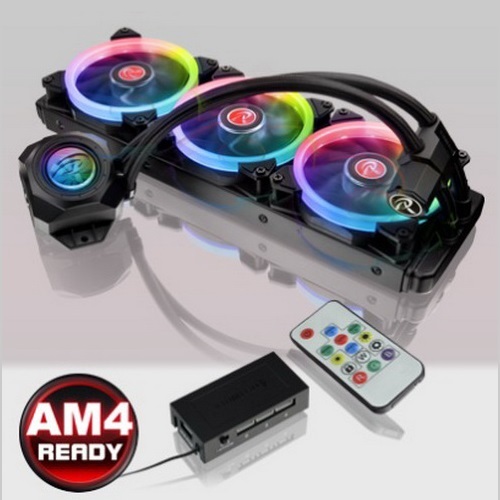 Furthermore, ORCUS cooling fan system is with 12025 RGB PWM fans, 8port control hub, and remote controller. With switch function (M/B ; Remote) of controller Hub, either you can connect control hub to M/B RGB header (thus, all cooling system RGB lighting including M/B RGB will be controlled synchronously by M/B), or you can switch to “remote” of control hub if no RGB header on M/B, then all RGB lighting will be controlled by Remote controller. ORCUS is not only one of the best performing All-In-One liquid cooling at the market but it is the most user friendly AIO cooler in the world by the pre-filled liquid, providing extra 100ml coolant for your convenience for refill, which brought to you for the joy of friendly design and the surprisingly efficient performance. 1.Keep and store the product away from the reach of children. 2.Check the component list and condition of the product before installation. If there is any problem, contact the shop where you purchased to get a replacement or refund. 3.RAIJINTEK Co., Ltd. is not responsible for any damages due to external causes, including but not limited to, improper use, problems with electrical power, accident, neglect, alteration, repair, improper installation, and improper testing. 4.CPU and motherboard are subject to damage if the product in incorrectly installed. 5.Breaking the tank seal on the product might cause warranty loss. 6.This product is an All-in-One Water Cooling Solution, once taken apart or any use of non RAIJINTEK’s accessories, will lead to a warranty loss.